Deadline for application is March the 15th 2015. 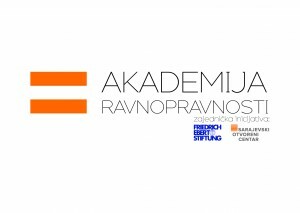 By launching Equality Academy, Friedrich Ebert Foundation and Sarajevo Open Centre are trying to make a new platform for political leadership and space for joint action of representatives, leaders of political parties and civil society organizations. Strengthening the cooperation between decision makers and representatives of civil society organizations in BiH. Advisors of political leaders and Ministers in cantonal, entity or state level, who are interested in strengthening their capacities and in identification and implementation of concrete solutions in order to improve gender equality and position of underprivileged groups in our society. Equality Academy consists of five modules. Every module lasts for three days. Three of these modules are dedicated to Bosnian participants, fourth module will be a regional event, with participation of politicians from neighboring countries. First four modules are consisted from lectures, workshops, discussions and meetings with representatives from civil society organizations. Lecturers have political practice backgrounds, and are members of international organizations and NGO organizations from BiH and region, gender equality bodies, but they also come from academic community and the media. 1. BiH – The most complex political system? Sarajevo, 24-26.04.2015. 2. Feminism for all Neum, 22-24.05.2015. 3. Politics to women Jahorina, 19-21.06.2015. Protection of minorities in EU integrations context Sarajevo, 11-13.09.2015. Fifth and final module will be a study visit to Zagreb, within which we will exchange the information with Parliament representatives, executive power, independent bodies and organization of civil society. Participants are obligated to attend every module. Organizers of Academy will pay for accommodation, food, refreshment and costs of participation on Academy. Travel expenses should be paid by the participants themselves. Organizers will pay all the costs of study visit to Zagreb (including travel expenses). How to apply to Equality Academy? Application (word or PDF file) should be consisted from a) a short biography (up to three pages) b) short motivation letter (up to two pages) which contains information how will you use knowledge and acquaintances made on Academy. In application must be c) contact phone number d) e-mail address, e) from which party and party organ are you f) are you representative in legislative power, or are you performing the function in the executive power of cantons, entities or state. Deadline for application is March the 15th. Number of participants is limited on 25. If there are more applications than 25, organizers will select participants considering gender, party and regional representation. Selected participants will be informed about it until the 1st April. Friedrich Ebert Foundation (FES) is established in 1952 as a political inheritance of first German president, Friedrich Ebert, who was elected in democratic way. Foundation has its offices in Sarajevo and Banja Luka. Foundation is pleading for cooperative dialogue between civil society and those who are political responsible. With help of local, regional and national partners, Friedrich Ebert Foundation is organizing different educational and informative programmes. Through their studies and publication Foundation Friedrich Ebert is analyzing central social and economic-political themes. You can find out more on www.fes.ba. Sarajevo Open Centre (SOC) is advocating full respect of human rights and social inclusion of LGBT (lesbian, gay, bisexual and trans*), people and women. Sarajevo Open Centre in independent, non political party and unprofitable organization which wants to empower LGBT people and women through strengthen community and through making movements. SOC is promoting publicly human rights of LGBT people and women and advocating enhanced legislation and better politics in Bosnia and Herzegovina on state, European an international level publicly. You can find out more on www.soc.ba. You can download a PDF version of a call here.